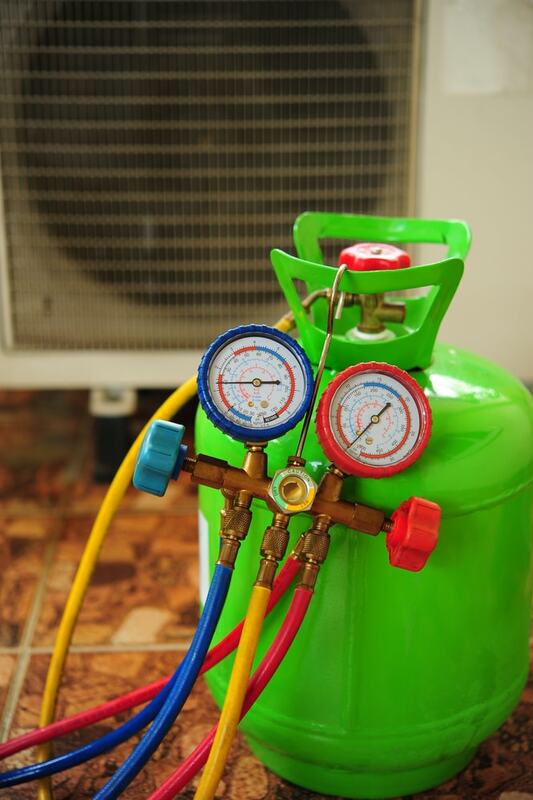 Freon is not as common a word in the American lexicon as it used to be. And that is greatly due to the phase out of the product that started decades ago. That common household name was once the main chemical component in central heating and cooling systems, but that started to gradually change in 1987 when the U.S. government decided to gradually get rid of the ozone damaging chemical. That chemical, technically referred to as r-22, is only a handful of years away from the end of its U.S. phase out timeline. Your home’s air conditioner, when it’s working the way it should, does not need added coolant. But like most machines, the ideal condition and the real world condition of the average central heating and cooling system differ. People who have recently discovered leaks in their older HVAC systems will already be aware that it’s getting more expensive to recharge the coolant. As less r-22 is available to technicians and homeowners the costs will probably continue to increase. Here’s what I learned about this trend and what we all may expect in the future. Some U.S. homeowners are immune to the problem of rising Freon costs. Newer homes, particularly ones built after 2010, typically have HVAC systems that use newer coolants, ones that will be around for a long time and are produced and distributed in greater quantities. But those of us with the older systems face a dilemma. Do we upgrade to a newer HVAC system, a decision that involves lots of out of pocket costs, or do we continue to accept the rising expense of recharging the coolant in leaking systems that regularly require a refill? How do I decide whether to convert my existing HVAC system to run with the new coolant type, replace the system entirely or just leave things alone? After researching this myself I concluded that the most cost effective choice is to leave the existing system in place at least until 2020, but that is only true if the system is running well and not leaking coolant. I also believe that a system that requires some component repair or replacement but does not leak is cheaper to keep than replace. I found that to be true after looking at the prices of replacement parts. Long after r-22 is no longer made there will still be new parts manufactured for the older systems. Those parts will not contain any coolant though. That is the most important thing to consider when making your own decision. At what point is it more expensive and time consuming to find a technician or coolant source still carrying the old coolant type? That will likely vary from one area of the U.S. to another. But keep in mind that some of that coolant will still be available in the form of reclaimed product, taken out of systems and reused, for years to come. What if the system is leaking heavily or near to failing? If your HVAC system is in poor condition then you may be better off trying to find a way to afford the cost of replacing the entire system. I arrived at that conclusion after examining the costs of replacing individual components of an older system. And here is the real problem with continuing to fix that old system. The newer coolant type, r410a, does not work with older systems. Trying to convert a system from r-22 to r410a is highly impractical. The system pressure is higher for r410a, the lubricant type is different and overall it’s a throwing good money after bad to even attempt a conversion for most homeowners. So what is best for someone on a tight budget whose HVAC system is leaking and doesn’t appear to have much time left before things start breaking? Anyone in this situation who plans to keep the house for more than a few years should think seriously about financing options. Some local utility companies and some HVAC installers offer financing options. And in some instances the monthly payments may be very reasonable. On the other hand a homeowner who does not intend to keep the house much longer can’t look at such a hefty cost as a good idea unless the new HVAC system will result in an equal or greater boost in the sales price of the house. There’s another thing to consider in all of this. If your system is leaking heavily then it’s not just costing money to recharge. It’s also releasing a chemical into the air in your house and ultimately into the atmosphere. And there is a good reason that the chemical was marked for phasing out in the first place. It certainly isn’t helping the environment to have it being released into the air from lots of older homes. For some homeowners that, coupled with the greater efficiency of newer HVAC systems from an energy use standpoint, is enough to make the cost of the new system acceptable.